Presented by Akko Art Gallery Bangkok Thailand. Below, find thumbnail paintings of famous artists in Bangkok Thailand. Click the thumbnails to go to their galleries to find bigger art images, plus many more works by the same artists. We also have many other up and coming artists represented on this website. Just click on one of the links above and enjoy seeing their works. Also, at Akko bricks and mortar gallery, in Bangkok, Thailand, you will find files of hundreds of artists from Thailand and other parts of Asia, as well as the rest of the world. The honor of National Artist was bestowed on chalerm Nakiraks by His Majesty the King. For a larger image, click on the thumbnail picture. Edvard Sasun is a powerful realist artist from the Russian Classical School. For more of his works click on the thumbnail image. There's only one Kamchorn style in Bangkok. To see many more larger size images click on the thumbnail picture. Xi-Shang is arguably the finest artist to come out of the famous Chinese Yunan School. Bigger images of several of his works can be seen by clicking on the thumbnail picture, which will take you to the FINE OIL PAINTINGS GALLERY. Noporath is the well known artist, who is the father of 4 sons and daughters; all artists. To see a larger image, click on the thumbnail picture, which will take you to the FINE OIL PAINTINGS GALLERY. 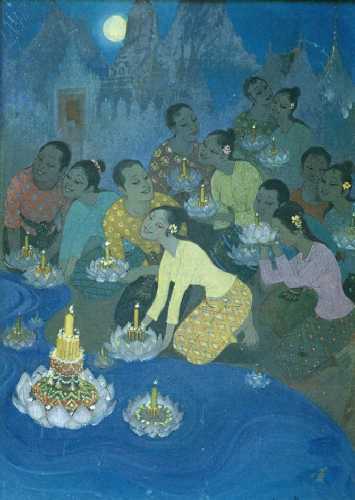 Somboon Phuangdormai's is one of the most noted Thai watercolor artists. To see a larger picture of this work and many others, just click on the thumbnail picture to go to her gallery. See larger versions of several of Ekachai's works by clicking on the thumbnail picture, which will take you to the COLLECTORS' OIL PAINTINGS GALLERY. 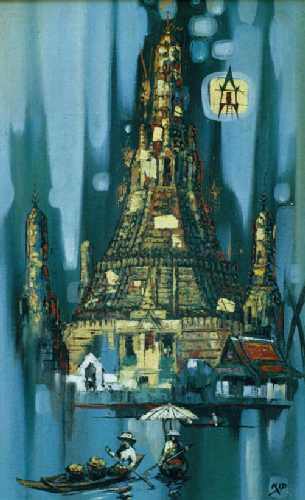 Le Than Thu is one of vietnam's top oil painters. To see a larger picture and others by the same artist, click on the thumbnail picture, which will take you to the COLLECTORS' OIL PAINTINGS GALLERY. 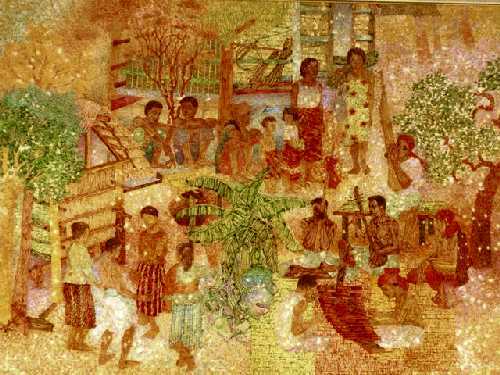 The Japanese artist, Niro Yokota, lived in Thailand from 1940 till he passed away in 1985. To see a larger picture and more of his works, click on the thumbnail picture. Press on this thumbnail picture, for more and larger images of the works of this outstanding watercolor artist, which will take you to the FINE WATERCOLORS GALLERY. Click on the thumbnail image to see a larger work in the FINE OIL PAINTINGS GALLERY. To see a larger image, click on THE thumbnail picture, which will take you to the COLLECTORS' OIL PAINTINGS GALLERY.